As soon as ETECSA began installing public access WiFi hotspots, black market resellers began sharing connections. They would connect a laptop to an ETECSA account then use pirated copies of Connectify, a connection sharing program running on the laptop, to create small WiFi hotspots of their own. At the time, ETECSA charged 2 CUC per hour online (two day's pay for many Cubans) and the re-sellers typically charged 1 CUC per hour. They broke even with two users and made a profit with more. Connectify got wind of this use of their software and instead of complaining about the piracy, they decided to give free licenses to anyone in Cuba. Last summer, I spoke with Bhana Grover, Connectify CEO, and she said they were seeing around 25,000 Cuban hotpots start each month and an average of around 2,100 daily users of those hotspots. (A "start" occurs every time the program is launched). Nano connected to WiFi access pointLast summer, I learned of a different approach to connecting to ETECSA hotspots. A street net in Pinar del Rio provided a gateway to a nearby ETECSA hotspot and allowed users to log on to their own ETECSA accounts from the comfort of their homes for a flat fee of 4 CUC per month, on top of the ETECSA charge. 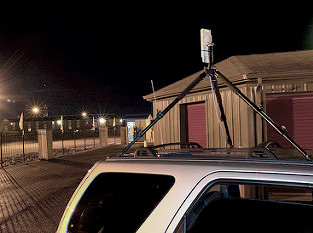 They used Ubiquity Nanostations with directional antennae so could be further from the ETECSA hotspot. Since the users were paying ETECSA the full access fee, they turned a blind eye toward the project, but the performance must have been degraded by hops through the street net. I've just learned of a third variation on the theme from Internet researcher Olga Khrustaleva, who was in Havana late last year. Olga said it was now common to see connectivity resellers, but they were now using Ubiquity Nanostations to connect to ETECSA, enabling them to be further away and therefore more difficult to detect. The reseller points the Nanostation antenna to the ETECSA access point, then connects that to a WiFi router in or near his or her car. Olga says the nanostations are selling for around $200 in Cuba (and as low as $50 for some models on Amazon), but ETECSA has cut the price of a connection from 2 to 1.5 CUC per hour and Olga does not know whether the resale price was reduced. I presume they power the access point using a car battery and an AC inverter and according to Olga, they assign sub-accounts to their users with a smart phone app. If you or someone you know is doing this, I'd like more technology and configuration details as well as a photo. (The photo shown above was not taken in Cuba). These jury-rigged networks and the small businesses they enable are reminiscent of the taxi business based on creatively maintained old cars, street nets, motorized bicycles, etc. — appropriate, do-it yourself technology developed under constraints. Local Time: Friday, April 19, 2019 05:48 AM PDT – Page Load: 0.3033 Sec.